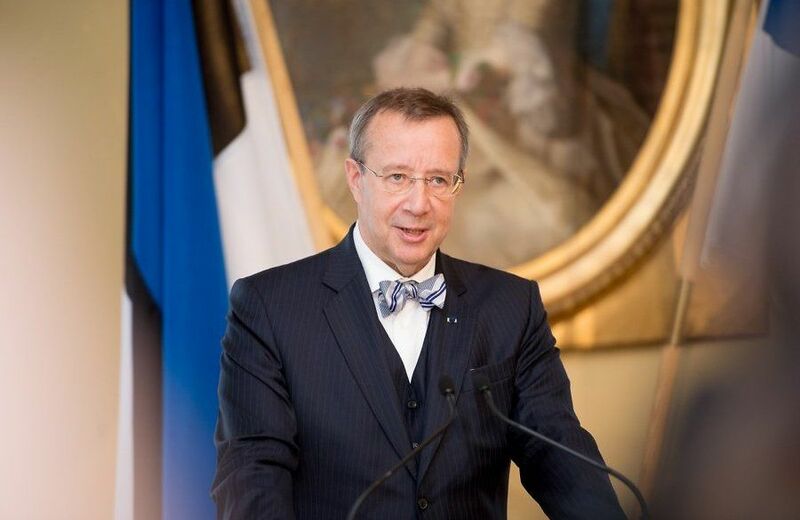 The Estonian president, Toomas Hendrik Ilves, said at the opening hearing of the parliament’s autumn session, speaking on the European refugee crisis, that Estonia has to look up from its toes and start seeing the big picture, the European picture. He also hinted that the parliament should deal with the question of hate speech legislation. When I spoke here a year ago on the occasion of the opening of the fall session of the parliament, the partial occupation of Ukraine was Estonia’s greatest concern. The memory of the Malaysian airliner was still fresh, and the incursion of Russian armed forces into Donbas continued. A year later, the situation in Ukraine had not changed much. A political stalemate continues and almost every day we receive reports on Ukrainian soldiers who have perished. However, much of Europe has forgotten about Ukraine. Because Europe is now facing a new crisis. As a child, as the child of war refugees, I did not really understand my parents’ stories about fleeing, something that is incomprehensible to a child. And I probably still do not understand the extent of the trauma caused by having to flee one’s homeland and sail in a small boat across the sea. However, the search for understanding has affected the course of my entire life. Already in elementary school I started reading so-called “adult” books about history. And seeking answers to the question: Why did people flee? How was it possible that a totally civilised people and culture, that had given us Beethoven and Bach, was gripped by such hatred that they started killing people because of their nationality? How is it possible that people were deported to the taiga only because the farms they had established in the course of several generations suddenly turned out to be too large or too successful? But it was possible. Hatred, envy, the readiness to destroy other people, with a shot to the back of the head or in a gas chamber, to terrorise the innocent and to torture is all part of our own recent past. It is the fear that this can happen to you that forces people to flee their homelands. Later, I started to question whether we, that is, Estonia’s leaders at that time, understood what was happening around them. Investigating this, a depressing picture was revealed, characterised well by a speech by Ants Piip, the foreign minister at that time, in Rakvere on 2 June 1940. I repeat, the speech is from 2 June – two weeks before World War II arrived in Estonia. What, however, is the reality of the current situation? We know that history does not repeat itself. However, a certain mentality can persist for a long period and through time. The understanding that we can withdraw to our bog island where the world and dangers cannot touch us, as Valdur Mikita has described our ancient world, is not credible. The idea that maybe it will all pass us by is very human, but was not credible in 1939, nor is it credible today. Being continually worried that the events of 1939-40 not be repeated, we have not understood the new threats. Let’s face the truth: currently, we that is, Europe, is threatened by an unprecedented wave of war refugees entering our countries. We are witnessing a new migration of people the likes of which was last seen a thousand or fifteen hundred years ago. That which has been predicted for years, I fear, is now at hand. Wars, killings, the inability of failed states to protect their people; in the case of Syria, the violence of an autocrat against his own citizens, great gaps in living standards – all this has set large masses of people into motion. If we do not understand that all of Europe is under pressure; if we hope that maybe this will pass us by in Estonia … Then I have to say that I have repeatedly seen this attitude in the past. When the crisis in Ukraine erupted, when it was claimed that these dangers are not southern Europe’s problem, perhaps it will pass us by. The lesson that Estonia must never be left alone, that Estonia must participate along with others, be among the decision makers, and that survival means contributing to the solution of common concerns, is just as important now as it has been throughout the years of our de facto existence as an independent state. At the same time, this current crisis has resulted more broadly from Europe’s own unwillingness to deal with the problems surrounding it. The wish not to undertake anything forceful, to limit oneself to declarations about one’s “serious concerns” about the events in Ukraine and Syria, has finally resulted in those concerns arriving in our backyard. I once wrote that if Europe does not go to its neighborhood, the neighborhood will come here. Today we see how the unwillingness to contribute more to the development of the Mediterranean area has resulted in a mass flight to our continent. In other words, Estonia has to look up from its toes and start seeing the big picture, the European picture. The topic of war refugees does not belong under the heading of ” Others about us”, and we have to do something only because otherwise “Europe will not understand us.” This is a question of the inner culture of all of us. How do we distinguish between war refugees and economic refugees in a situation where the flow of migrants has gotten out of control? In this situation we have to contribute to and help our fellow Europeans. Otherwise, we forget where we belong. The question is how we – we in Estonia, we in Europe – will cope. How will Europe manage, or how will we manage? In a situation where it is estimated that more than 100 million people are on the move. And more than a million of them have already arrived in Europe. The answer to these European problems is a strong, united and significantly more active Europe. A Europe that is not only like Venus, but a little like Mars, to borrow Robert Kagan’s onetime characterization. This, however, assumes that we take united and perhaps difficult steps. Just like the answer to an aggressive Russia is a strong and united NATO. Estonia cannot lock itself down; we cannot cope with these problems alone. In order for us to cope with everything, to be able to take the important decisions, we must maintain civility in our mutual discussions. This has disappeared during recent years, and especially during recent months. The language previously seen only in anonymous commentaries has now heard in politics. And the commentaries themselves have changed, becoming harsher and more threatening. About 100 years ago, Johannes Aavik gave us a word, which unfortunately, unlike other words like relv, roim, hetk, veenma, did not come into general use. The word is herjama, a verb that describes personified and threatening abuse, which is much clearer then the impersonal and abstract vihakõne (hate speech). This is not passive “speech”, but an active undertaking. Specific people herjavad and promise loathsome revenge against those who disagree with them. This has become intolerable and has nothing to do with the freedom of speech for which I have always stood. I await for the Riigikogu to start to deal with this question. Now that threats of beatings and rapes are made against specific people, when people, even members of Parliament, are threaten with their homes bing burned down, we must think seriously about how to effectively put a stop to this. So that the names of the abusers are made public. So that there will be consequences to herjamine. I also hope that a line is drawn on the current populist practice of criminalization. Not everything needs to be criminalized, for instance, demanding that people who have served their sentences based the constitution be vulnerable to additional punishment and restrictions. I would be pleased if more than six months after the elections, the representatives of the people would deal with important and meaningful things, instead of endlessly amending the coalition agreement. This and the incomprehensible replacements of ministers leaves the impression that this is a temporary government, and does not allow one to feel anything but apprehension during this time when critical and difficult decisions are necessary. I seriously hope that the budget proceedings that will soon start in this hall will progress smoothly so that the government is not tempted to organise another “confidence survey” in parliament. I could not stand here and not speak about the reasons for the farmers gathering outside this building. I call upon all of you to understand that farmers have not gathered on Toompea today just to protest. Their anxiety and concern about agriculture and more broadly rural life is justified. For various reasons, pig breeding and dairy cattle breeding have been hit the hardest. Let the Estonian parliament and Estonian government become an ally to the Estonian farmers, and find opportunities to quickly support them. If this means extraordinary crisis aid, then this aid must be given. If it means paying transitional support from the state budget, like the Europe Union allows, then this support must be paid. Let’s look at all this in the general context of the European Union and our farmers in comparison to farmers in neighboring countries. We see intense competition. Unfortunately, those are strongest who are supported in the permissible way by the state and those at whose expense the state economises are weakest. Estonia should not be among the latter. Estonia should respond to its farmers’ concerns with solidarity, which is one of the strengths of the European Union. Finally, this is a question that not only affects a single economic sphere; this is a question of survival for rural life outside the cities. And, I encourage the farmers to cooperate more. This will provide strength for alleviating the crisis. The Estonian people, both you, me and everyone else, must take a fresh look at our own myths about our country and our people, those self-evident social axioms that have inspired all of us. Starting from the Age of Awakening in the 19th century, there have been several narratives that have spurred us on. Firstly, the 700-year-long “night of slavery”, which culminated with the Battle of Võnnu and the confiscation of the (Baltic Germans’) manors. We have probably long ago recovered from the herjamine of Jakobson’s time. The Soviet occupation killed the myth of the (German) “age-old enemy” in one year. Now we would be quite happy, if similarly to the Swedes in Finland, we had a small number of German-Estonians here. Secondly, the Russian times or Soviet occupation. The resistance to Russification, the striving toward the rule of law, an independent court system and condemnation of communism has carried us for a long time. Will this, however, carry us forward now that we shall soon celebrate a quarter century of independence? Please, let’s debate this. Because now, as I said earlier, we face completely different problems. And the third myth, that Estonia is a country with a liberal economy, characterized by the expression, “the state is a bad master”. Maybe the state really is not the best master, but it seems to me that there are important spheres of activity in Estonia were there seems to be no master at all. This brings us to the concepts of “administrative reform” and “state reform”, where we have too often and for too long seen only cosmetic improvements. After a quarter of a century of the restoration, establishment and strengthening of our own state, we should weigh whether the initial and erstwhile bold principles remain as appropriate for a well-integrated member state of the European Union and NATO. A modern state must be effective but this also means that the state must decisively impose its will in significant issues related to the life of the country, such as education, infrastructure and internal security. In education inequality, duplication and fragmentation is rampant. Infrastructure is characterized by local corruption, extravagance generated by wishful thinking and dangerous gaps omissions. Internal security has been left an abandoned child, where the state requires rescue workers, police and border guards to fulfill their assignments under conditions not suitable for a sparsely populated country. I mentioned corruption. We have talked for years about the management of state-owned companies and the responsibility that this entails. In this case, we cannot say that the state has been a bad master. More of a careless or negligent one. Only now have we found out that the farmhands have been stealing from one of the storehouses for a long time and the master has not even noticed. In the management of companies of strategic importance to the state, we cannot tolerate a lack of responsibility. The statement “I didn’t know” is not an excuse. If this parliament needs a assignment and a narrative, then I would formulate it as follows: let us renew Estonia. Let us tackle the serious jobs and leave aside the displacement activities. We cannot get in the way of events: education, administrative reform, the swine fever outbreak and receiving war refugees from third countries – all these issues should and could have been dealt with long before they turned into a crisis. But for some reason, these problems almost always strike Estonia unexpectedly. I hope that an active parliament is able to foresee problems and manage processes. If we lose control of a car on a slippery road, we do not close our eyes, let go of the wheel and hope that it maybe everything will be OK. Quite the opposite. We grab hold of the wheel more forcefully. We make an effort to get the car back on the road. Let’s so the same with the country. Cover: Toomas Hendrik Ilves (credit: Ilmar Saabas). The opinions in this article are those of the author.